Sports sponsorship has always been an attractive option among a wide variety of brand categories, be it food and beverage or financial services. With the advanced technologies available to sports teams and fans today, it comes as no surprise that technology brands have jumped into the fray, by sponsoring major sporting events and organizations. Integrated technology has found its way into every facet of sports, from fan apps and Wi-Fi enabled stadiums to digital playbooks. Athletes and teams use devices in their helmets, shoulder pads, bats and more to train and further understand their capabilities. Sporting events and venues use technology for easy online ticket booking, faster and easier payment options and more to improve fan experience and engagement. For fans at home, advances in virtual reality (VR) and augmented reality (AR) may soon provide the same experience as watching their favorite games from the sidelines or court side, all from the comfort of their home. Esports, which has recently evolved into a sport by itself, would not even be conceivable without the many technologies that power it. In addition to the sports-focused technology companies, it would be remiss not to mention the contribution of mobile, digital and social media. These advances have revolutionized the way fans interact with their favorite sport entities, opening new channels for communication and allowing fans into the everyday world of athletes and teams. Mobile phone manufacturers and social media giants alike have started to involve themselves in sponsorships, along with sports technology and data companies. Sponsorships by technology companies is more complex than other sponsor categories. Instead of just sponsoring a sporting event and placing their logo on jerseys, venues, etc., technology companies have a dynamic engagement and influence with their sponsored properties. Sometimes, like in the case of Intel, IBM, or Amazon Web Services, they are the technology partner of the sponsored property, providing support at the back-end and collecting game and player data which can then be used to improve the property’s performance. Or, in the cases of AT&T or Samsung, they improve fan experience and engagement through their devices and apps, ensuring that the team/event has a positive association with its fans. This integration of technology and sponsorship leads to an authentic and credible association with the sponsor’s customers. 1. By being a part of the game, technology companies can easily demonstrate their capabilities to its target audiences. For example, Chinese cloud and e-commerce service provider Alibaba and American multinational chip manufacturer Intel were two companies that signed on as TOP partners of the Olympic games in 2017. These companies along with previous Olympic technology partners such as Atos, Panasonic and Samsung now make up approximately 40% of the TOP sponsors. 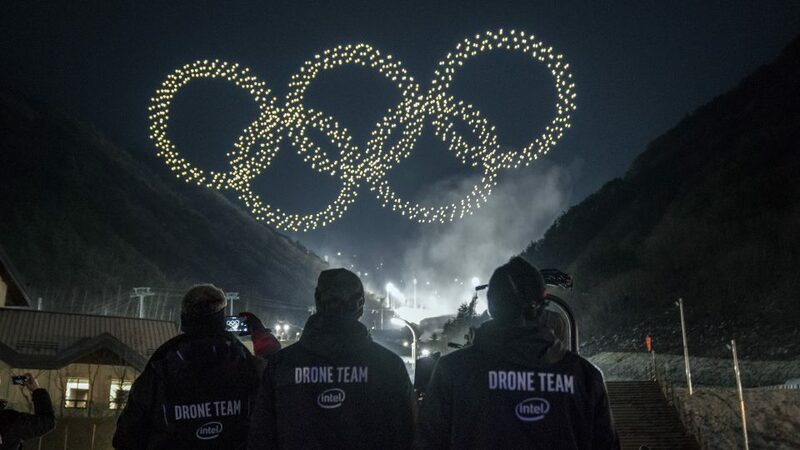 The drone show by Intel at the Olympics opening ceremony was well received and provided top of mind brand awareness globally for Intel among its target audiences. Intel also had the second largest engagement among the TOP sponsors on its social platforms (behind Coca-Cola) with 10M engagements during the Olympics. 2. Sponsorship helps technology companies easily capture new markets and increase awareness. One great example of this is Chinese mobile manufacturer Vivo, a practically unknown name in India until its sponsorship of the largest sporting event in cricket, the Indian Premier League from 2015. Today, it is the third largest smartphone manufacturer in India, behind Samsung and Xiaomi. To further increase its presence in the global market, Vivo also sponsored the FIFA World Cup 2018. 3. SAP, the German software corporation provides insights to many major leagues, teams and organizations across multiple sports. They have partnerships with two of the biggest American leagues- the NBA and NHL, multiple teams — New York Giants, Yankees, Knicks, New York Jets, New York Rangers, 49ers, the WTA as well as more niche sports such as sailing and equestrian. By analyzing player stats and applying advanced technologies on the court/field, SAP is not merely a sponsor but also a way for the team to improve. This partnership integrates the sponsor’s products with its properties, creating a close and natural association with its properties as well as fans. 4. Advanced technologies such as Artificial Intelligence(AI), can provide fans as well as sponsored properties with unique and exciting new experiences. 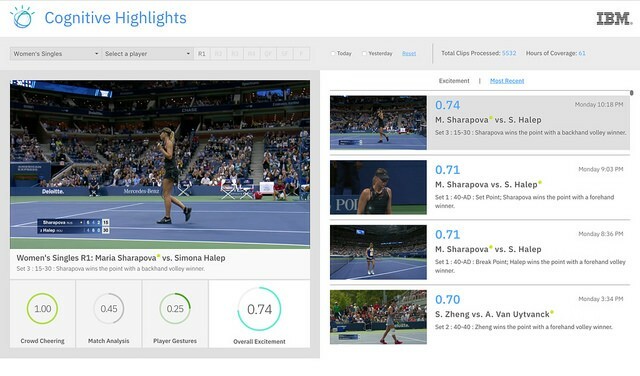 IBM, one of the oldest information technology companies in the world, partners with major tournaments such as The Masters, US Open Tennis, and Wimbledon. For example, during The Masters, it used its AI technology to analyze and provide data insights to The Masters, while driving a personalized fan experience through the Masters mobile app. This sponsorship improves the fan experience and builds brand awareness for the capabilities of IBM and Watson in a way that only sponsorship could. 5. Availability of mobile screens through which consumers can watch the same content as sport broadcasts plus engage with their favorite sport entities, have contributed significantly to the popularity of digital and social media. With the amount of social and digital media options available to consumers today, social media giants are also jumping into sports sponsorships and experimenting with the different options through which they can reach consumers. Digital and social media also provide streaming options and are popular options among the younger viewers who brand themselves “cord cutters” or “cord nevers”. Twitter and Facebook both streamed MLB games on their platforms, allowing fans access to both prime time games as well as games played during less popular time slots that are not usually broadcast on television. Amazon will broadcast 11 NFL games during the 2018–19 season at the same time as the Fox network, making it a handy and flexible option for sport fans who can watch the games from wherever they choose. Amazon is also streaming these games for free on its Twitch platform, creating a new viewing option for its fans. YouTube TV burst onto the sport scene as a presenting sponsor of the World Series in 2017 to increase awareness of its new offering of a streaming TV service. It renewed its sponsorship with the World Series for 2018, while inking a new sponsorship deal as the presenting sponsor of the NBA finals. It is also the exclusive streaming partner of LAFC, the new Los Angeles-based MLS team that features the YouTube TV logo prominently on the team’s jerseys. This sponsorship deal breaks the mold of a typical jersey sponsorship which is focused on awareness, but benefits fans by establishing the service as the go-to platform for LAFC team content and games. 6. Esports, the newest mainstream segment of sport, is completely powered by technology. Technology companies are the natural sponsors here, with sponsors from other categories vying for a place in the esports space. This is one area of sports where technology is present front and center, with leagues, teams, and athletes alike sponsored by top hardware manufacturers. Intel, AMD, HP, Logitech and Twitch, the largest streaming platform for gaming, are some of the top sponsors in this space. A decade ago, a well known technology sponsorship would have been unheard of in sports, especially at the level of integration that it is at today. 5 years ago, sports streaming on digital and social media would have been even harder to think of. But, with the growing advances in sport and technology it was inevitable that both would combine to produce a “new endemic” partnership. Technology companies however, need to step-up their game when it comes to sponsorship promotions on social and digital media, as demonstrated by the Hookit Brand Score. 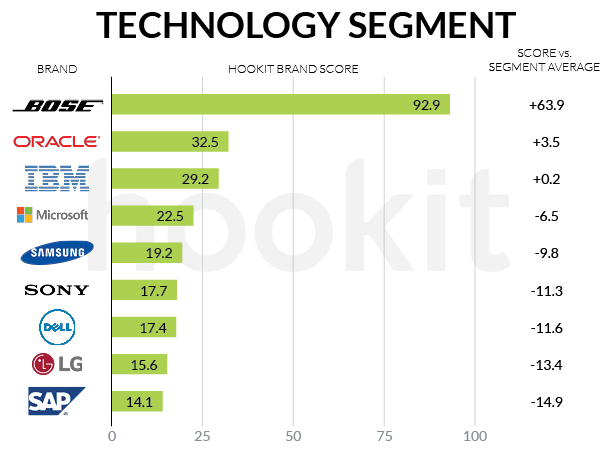 Bose was the only technology sponsor that performed above and beyond when it came to its sponsorships, while other technology sponsors fell far short of the segment average. 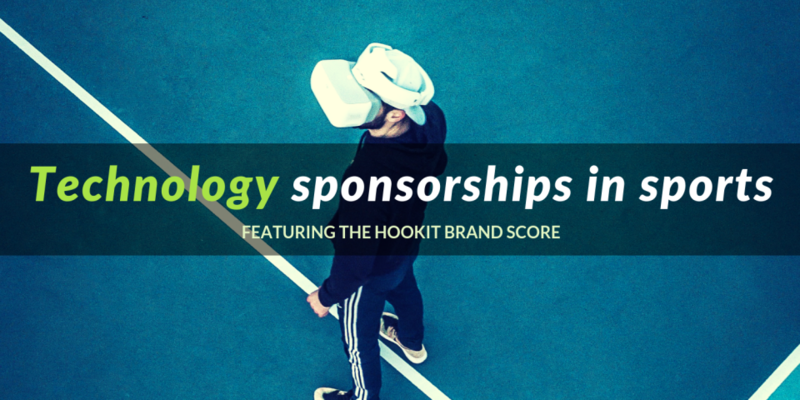 Want to learn more about the Hookit Brand score and about how technology companies are leveraging their sponsorships? Download Hookit’s brand guide below!